From our new home on Planet Earth to the depths of outer space, the Intimitrons from Area 51 would like to thank our sponsors for their generous contributions to our team and our cause. Without their support, we wouldn't be able to participate in competition, have access to advanced tools and equipment, or purchase materials to build study and learn. 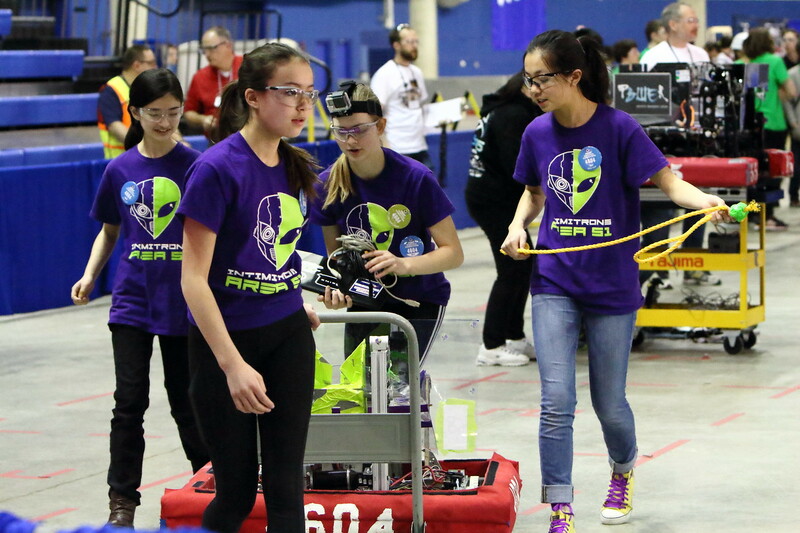 More importantly, we wouldn't have been able to reach dozens of young women in Calgary and provide them with the opportunity to explore STEM and build confidence in their abilities. FIRST Robotics Competition is a competition where high school aged students design and build a robot in a time frame of six weeks. Not only do we learn technical skills, but also important business and life skills along the way. Byte level is a great way to let Calgary know that your company supports STEM education. We rely on our sponsors to fund our regional competition entrance fees for each season as well as travel and robot parts. For our Kilobyte sponsorship level, you will get Byte perks plus we add your logo to some of our promotional materials such as flyers and on our season competition banner which is displayed in our pit and at outreach events. For our Megabyte sponsorship level, you get Kilobyte perks plus we give your company a shout-out on social media as well as display your logo on our robot. It's important to us that people know how awesome our sponsors are. For our Gigabyte sponsorship level, you get all Megabyte perks plus 1 banner ad on our website and a VIP tour of our pit at 1 regional compeititon where you'll get to experience the excitement of FRC first hand. Terabyte sponsors are instrumental in facilitating our participation in competitions away from home. You get all Gigabyte perks plus prominent logo display on all of our digital and print marketing materials. You also get an additional VIP tour and 2 award banquet invitations. In-kind sponsors are instrumental to our success by donating materials, workspace, equipment and most importantly their time. The expertise of professionals working in mechanical engineering, machining, software engineering, electrical engineering and more give us a head start on learning skills that prepare us for higher education. If you have machine shop or electronics equipment that is collecting dust, or you would like to support the next generation of girls in STEM by volunteering your time and experience, please send us email at info@intimitrons.ca. Support from the community through our GoFundMe helps us pay for entrance fees and travel expenses. The more supporters we have, the more opportunities we have to learn and grow! Every $ counts.